How to watch NRK live stream from abroad? I would like to watch the NRK live stream from abroad, but it is only available to people in Norway. Can you help me solve the problem? Thank you for the question. We have already answered this question in another blog post available, though that question dealt with the question how to get a Norwegian IP address. The reality is that the reason why you can not watch NRK from abroad is that the live stream is locked to people with a Norwegian IP address, thus the solution to the problem is to get a Norwegian IP address, and then the live stream will be available to you at once. To fix this problem we normally recommend to use the services of HideMyAss. 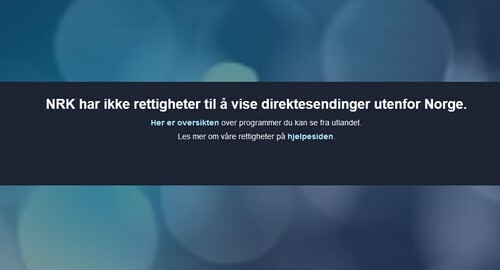 They offer a VPN service giving you a Norwegian IP address, and if you visit their page, register and download their program and make a subscription you can find yourself watching the NRK livestream in 5 minutes from now on. – How to get a Norwegian IP address? We have used this service lots of times ourselves, and not only to get a Norwegian IP address making it possible for us to watch NRK live online, but we have also used it to see German TV online, Hungarian TV online and lots of other broadcasts which are normally limited to people with local IP addresses. In addition it is given you an encrypted connection making you and your information safe and protected on the net. This is especially important when using open WiFi networks all around the world without any form of encryption. Enjoy your protected web surfing and enjoy the broadcasts of NRK online. Ps: If you first get a subscription with HideMyAss, do not forget that you can use this in the same way to see other nations TV channels live on the net. Thus you can for example watch the British X Factor or Champions League matches live on ITV online on the web, or watch Italian Rai or similar channels normally locked with a geo block. Enjoy! Works just perfect 🙂 Thanks for the help! « How to get a Norwegian IP address?